Cora Harrison is well used to fine dining -- the author of dozens of books for children and adults says that "whenever publishers have a new young editor, the first thing they want to do is take you out to lunch. And I have a lovely agent who lunches me in style at his club whenever I go to London." Today, though, it's not some publishing industry big-wheel but your humble correspondent. And the location isn't some swanky London eatery -- it's much better than that. We're sitting in An Fulacht Fia, a lovely restaurant with a fantastic setting: right in the heart of the Burren in North Clare, with the Atlantic Ocean right outside our window. Situated about half a mile past Ballyvaughan, as you travel the coast road south, An Fulacht Fia is just about the ideal place for meeting a woman who moved to the Burren years ago, fell in love with the place and has lately used it as the backdrop to a series of popular, well reviewed crime novels. The Burren Mystery series, published by Severn House, tell the story of Mara, an investigating magistrate under the Brehon Laws, Ireland's ancient judicial system. The first book came out in 2007, and the 11th in the series, Cross of Vengeance, was released last September. The next novel, Verdict of the Court, is published next March -- Cora is a prolific writer, to say the least. She's also a lovely lunch companion, intelligent and witty, very genteel, softly spoken -- I'd call her "ladylike" if that didn't seem like such an old-fashioned term. Over mineral water and two superb starters of vegetable soup, she gives the background to the series: "The first book is set in the first year of the reign of Henry VIII, in 1509: before England completely took over this part of Ireland, but at the same time there's a sort of fin-de-siècle feeling, that this wonderful Brehon law was on the way out. I'd always assumed the Brehon law dated from around the time of St Patrick, but it lasted much later. "My husband and me had bought a holiday cottage between Corofin and Kilfenora (also in the Burren), and were wandering around one day and came across Cahermaughten Fort. I saw that there was a Brehon law school here in the middle of the 16th Century. I was astounded. "I love history, and books about the Tudor era. And I was struck by this startling contrast between the very community-based Brehon law, very humanitarian, mild, civilised, even modern -- and the top-down royal system which was coming in. Steal a loaf of bread and you'd be hanged. English women of that era would be burned to death for cheating on their husband, whereas Mara was handing out divorces." The Brehon system, she says, was "very good for women, very egalitarian. And the big aim was to have peace in the community. There was a fine for virtually everything. No brutal punishments; they hated to shed blood. The worst crime was to kill a near relation, and for that you were put into a boat with no oars and sent out on the tide -- leaving you to God." It's clear, from how Cora talks about her, that Mara is a woman very close to her heart. She admits that, like many writers, she sometimes feels that this fictional character really exists. Interestingly, she first wrote the detective as a man, and her agent suggested she make the character a woman. "And that really worked for me," Cora says. "She came to life. I thought of her as one of the girls. The Burren Mystery books are probably the ones I'm most interested in myself; they're more 'me' than any of the others. I can relate to Mara much more than my other characters. I almost feel as if she's a very good friend -- you kind of know what she's going to say. "I find her character development interesting. I love the Brother Cadfael mysteries, but he's a monk and there's no change in his life from book to book. Whereas Mara progresses from being a divorced mother of one, to being married again to King Turlough, which changes her life tremendously, though she's determined to remain a working woman. Then she has a son, and she's having problems with him as he gets older." 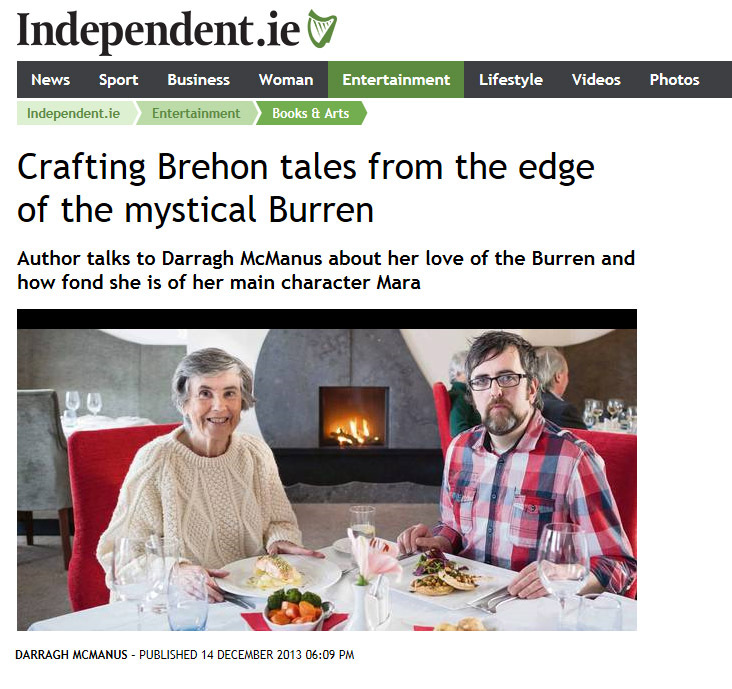 Mains arrive -- salmon fillet for Cora, a lover of fish dishes, an aubergine and chickpea tart for myself, potatoes and buttered carrots on the side for both -- and she explains how the amazing, almost otherworldly Burren landscape has impacted on the novels. "I have a theory that people are shaped by their environment," she says. "Someone had described my Burren series as being unlike, say, CJ Sansom's historical mysteries set in London, in that they're almost too good to be true. And I thought, well, his books are set in a city, a terribly crowded environment, very dirty and smelly. "Whereas I see no reason why the Burren should be like that. People were spread out, they don't impinge on anyone; there probably weren't any smells that were particularly different to nowadays. People used to whitewash their houses, inside and out; it was a surprisingly clean environment. And all that has an effect on moral character. "They weren't too much on top of each other, you don't get the aggro and friction of a city. The Burren is a beautiful part of the world, and I love living here." It's been a circuitous sort of route for Cora to get here, both in terms of her physical location and where she's at professionally. Born in Cork, she did a degree in French and German (despite, she says, history being her best subject in school). She moved to London and worked for Linguaphone and as a head-teacher in an English primary school. Cora and her husband then retired to Kilfenora in the 1990s: "We bought a cottage with 20 acres, on the edge of the Burren, with a river and Iron Age fort on site ... and paid £15,000. Quite a bargain. We had this idea of self-sufficiency but didn't really work out -- I think the hens cost us more than they earned!" Although she'd always liked mystery novels -- "The cosy end of the genre, I'm not a great one for violence" -- Cora didn't have some burning lifelong desire to write. Then fate intervened. "I picked up an antibiotic-resistant bug while visiting someone in hospital, and got very ill and weak for months. I couldn't even walk without collapsing. I was so depressed, in a lot of pain. My son suggested I write a book, so I started writing the Drumshee series for children, and got them published by Wolfhound. There were about 17 of them in total, historical books. They're all out of print now, although I still get money from the libraries for them. "That was the beginning of it. Then I tried my hand at books for adults, and had ideas about the Burren and Brehon law, so decided to put the two together." As well as the Mara and Drumshee books, Cora's portfolio includes the children's books I Was Jane Austen's Best Friend -- "historical, sort of girlie" -- the Debutante series, set in the 1920s, and the London Murder Mystery series, which she describes as "Dickensian -- young boys living together and solving crimes". The Burren series sold, originally to Macmillan, in "just a few weeks", but Cora admits that publishing is "often a lottery. The book goes out there and you can't necessarily tell how it'll do. I'd love to see the Mara series as a TV show -- twice it's been close to getting made by BBC Northern Ireland. That would be great". Well, it certainly sounds tailor-made for television, incorporating elements of period drama and police procedural -- both hugely popular in print and on TV -- with a great female lead and cracking mystery plotlines. And you couldn't get a better setting. Looking out the window of An Fulacht Fia as dessert is eaten and coffees are drunk, the Burren is so sublime, it's almost more like a fiction than reality anyway. This place would definitely light up the small screen. Cora Harrison taught primary-school children for twenty-five years before moving to Kilfenora, County Clare, to live on a small farm where there used to be an Iron-age fort. Cora Harrison has written many books for children of all ages. Cora often tours Irish schools to encourage children aged 6-11 years to develop their writing talents. Cora has written this short biography for her youngest fans. "I was born in Cobh, County Cork, Ireland, but lived in Cork city for most of my life until I was twenty-one. When I was about seven years old, I became very ill and between the ages of seven and thirteen I hardly went to school. I used have to stay in bed at home, or in hospital, for weeks at a time. I used to pass the time making up stories. I remember that I used to draw little figures dressed up in historical costumes and draw horses for them and I used to have my ladies and knights in armour riding from castle to castle through the humps and hollows of the bedclothes. Occasionally, I used to write out my stories, but I had very bad handwriting, and not too good spelling either, so mostly I just made them up. When I was about fourteen, I recovered and began to attend school normally. I went to University College Cork and after I graduated I went to England. I got married to Frank and had two children: William and Ruth. Now I have one little grandson, Shane. While my children were growing up, I became a primary school teacher and loved teaching history to the children. Some of my happiest memories are of making shields and armour of cardboard and then going to fight the Battle of Hastings at the very spot where it took place almost a thousand years ago. I really enjoyed my time teaching but I think that I enjoy writing stories even more. It still gives me a thrill to see my books in the shops!"